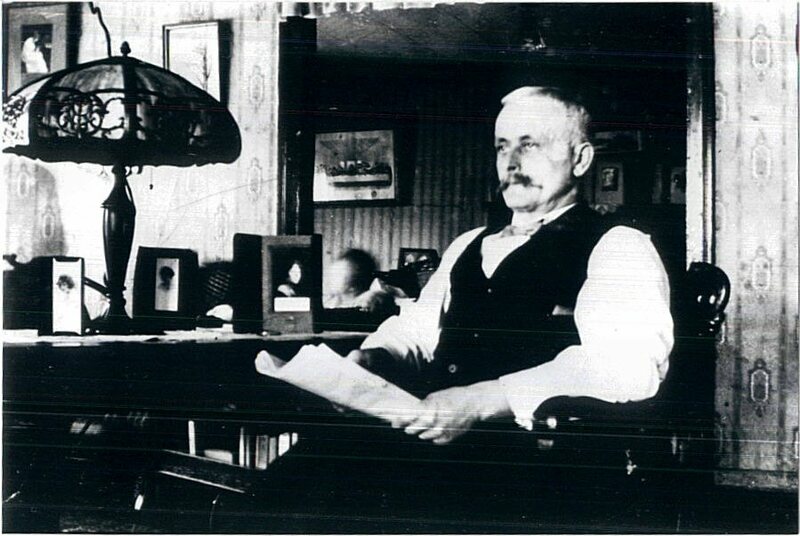 Francis Joseph Spinner, known as Frank, was born and raised in Village Creek, Iowa in Allamakee County. He was born on July 17, 1861. His parents were Peter and Katharina (Markt) who both were natives of Germany. Frank was the second son and the second oldest of the eight children born to Peter and Katharina. His siblings include his brothers, Carl, Fred, Peter, William, Constantine and sisters, Mary, known as Mayme, and Katherine, who died at age one. Frank’s father, Peter, owned a blacksmith shop in Village Creek. After several years, Peter bought land in Village Creek while still maintaining the blacksmith shop. His wife and sons helped him clear the land for farming. Frank learned the trade of a blacksmith from his father and moved with the family to the farm. Frank lived on the farm and worked in the shop with his father until he was twenty-four years old. Frank then went into business with his older brother, Carl. They opened a blacksmith, wagon and repair business in Waterville, Iowa, known as Spinner Brothers. After about four years, Frank sold his business shares to Carl and left Iowa to go to Helena, Montana. He worked as a blacksmith in Montana where he found the wages and business conditions were good. After a year and a half, he returned to Iowa and ran his father’s blacksmith shop in Village Creek. 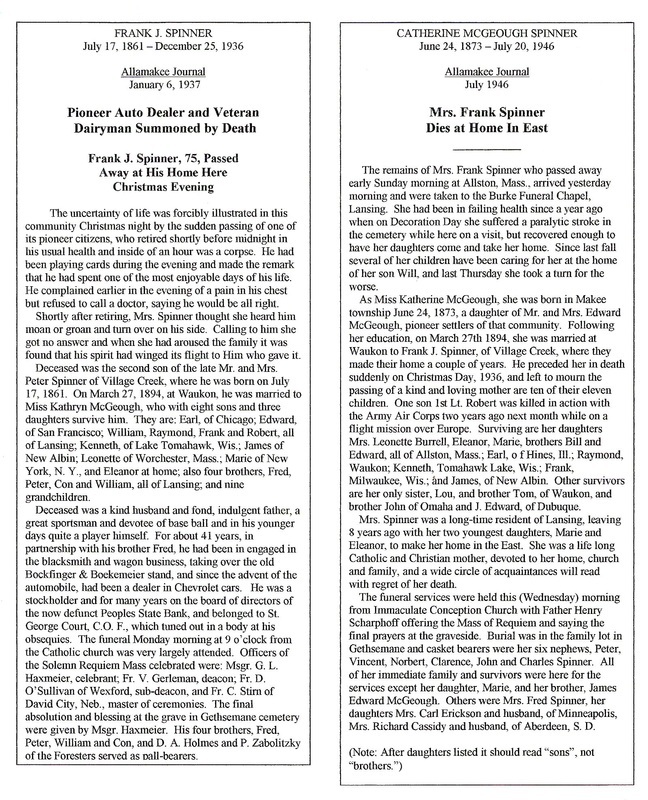 Frank married Catherine McGeough the daughter of Edward and Julia (Hinchon) McGeough from Waukon, Iowa. They were married on March 27, 1894 at St. Patrick’s Catholic Church in Waukon. Frank continued to work at the blacksmith shop in Village Creek until 1895. Frank and Catherine moved to Lansing and Frank became a business partner with his brother, Fred. They started a blacksmith, wagon and repair shop. In time they added a complete line of farm implements, wagons, buggies and later automobiles when it became a Chevrolet dealership. The Spinner Brothers business was very successful. It was located in Lansing on the south side of Main Street at the current addresses of 359 to 377 Main Street. The Spinner Brothers also had a branch in Harpers Ferry. Frank and Fred were in business together for 41 years. Frank was also a silent partner with his brother, Carl, in the general merchandise business in Waterville. They built a new, modern building of cement blocks in 1912. Frank and Carl were in that business together from 1894 to1913 when Frank sold his business shares to Carl. Frank J. Spinner was a leader in the Lansing community. He was a charter member and stockholder in the Peoples’ Bank of Lansing. He was a member of the City Council. Frank also was an excellent baseball player and played for the town team of Lansing. 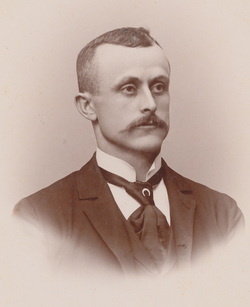 In his later years he continued in baseball as a coach/manager for the town team. Frank and Catherine had eleven children, eight sons and three daughters. The family lived in a large, corner house in Lansing at 401 Main Street. The family belonged to the Immaculate Conception Catholic Church. Their children were Earl Francis (1895-1956) known as “Spike;” Raymond Joseph (1898-1982), Leonette Catherine (1899-1970), William Terrance (1901-1957), Marie Julia (1902-1989), Edward Peter (1904-1958), Francis Thomas (1910-1981) known as “Frankie,” Kenneth John (1911-1958) known as “Cap,” James Cletus (1912-1970), Robert George (1915-1944), and Eleanor Olivette (1918-1999). Seven of Frank and Catherine’s eleven children married. Raymond married Della Severson. Leonette married Everett Burrell. William married Dorothy Rethwisch. Edward married Ned Egan. Frankie married Florence Bohrer. Kenneth married Norma Sowatzka. James married Doris May. Frank J. Spinner did not live long enough to know most of his twenty-four grandchildren. He had twelve grandsons and twelve granddaughters. The oldest grandchild was born in 1922 and the youngest was born in 1949. Frank J. Spinner died on December 25, 1936 at age 75. He slipped and fell on the ice on Christmas morning, but seemed fine all day. He died on Christmas night. Whether or not the fall had any part in his death was never determined. He is buried in Gethsemane Cemetery in Lansing, Iowa where his wife, Catherine, and children Earl, Ray, Billy, Marie, Bobby and Eleanor are also buried.